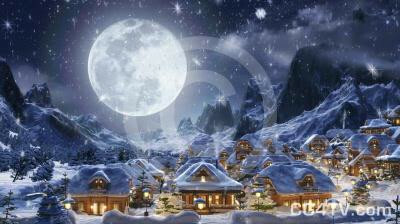 Christmas Snowfall Animation: Icy flakes gently fall from the moon-lit sky to blanket the cozy village below. EXCLUSIVE product. Christmas Snowfall Animation is only available from CG4TV.com. We don't have resellers or representatives. This product that can not be purchased elsewhere. Christmas Snowfall Animation. Grab your coat and mittens! You’ll think you’ve stepped into a Courier and Ives print with our 3D, high definition Christmas Snowfall Animation. Charles Dickens couldn’t have done better. Icy flakes gently fall from the moon-lit sky to blanket the cozy village below. You’ll think of the pristine quiet that reigns on Christmas Eve as the snow gently falls, of how the frost bites your nose and freezes your toes. You’ll want to hurry to your warm and fragrant Christmas kitchen. Our Christmas Snowfall Animation evokes visions of the holiday season. It summons thoughts of loving hearts, of Christmas cheer, of sleigh rides and hot chocolate. The beauty of Christmas. The warmth of a cheery home. A visit from Jolly Old Saint Nick. Let your imagination be your guide in how you use it. Why spend money and time developing a custom animation? Royalty free use of our low cost, premium quality, high definition, 3D Christmas Snowfall Animation will be easy on your wallet and on your busy schedule, too. We have the most charming Christmas Snowfall Animation footage you’ll find. Don’t wait. Get your Christmas Snowfall Animation now. It’s easy. All it takes is a few simple clicks of your mouse. Download is immediate, and we accept all major credit cards. Since we're constantly adding to our collection of high definition stock 3D animations, you're sure to find just the right one for your project. But if you don't find the one that works for you, or if you have questions, contact us at info@cg4tv.com. We're always open to suggestions for how to add to our 3D Animation Catalog, as well as to our Stock Image, Virtual Set and Animated Backgrounds collections.